Vitamin D / Daily "Sunbath"
-- Why is Cure Ignored? ---LP(a) - "The Repair Man"
Cholesterol does not cause heart disease! Arrythmia is a condition in which the heart beats too fast (bradycardia), too slow (tachycardia), too early (premature contraction) or with an irregular rhythm (flutter or fibrillation). This occurs when electrical signals to the heart that coordinate heart beats stop functioning properly. Symptoms can sometimes be felt as palpitations (a feeling that your heart has added or skipped a beat, or rapid pulsations), possibly including dizziness and/or difficulty breathing. The SA node is the heart's primary natural pacemaker. Normal heart rhythm of 60-100 beats per minute is controlled by the SA node located in the right atrium. The specialized cells of the SA node generate regular spontaneous "slow response" (i.e. slow depolarization) action potentials through the muscle tissue of the atrial and ventricle chambers at a rate of 100-110 action potentials ("beats") per minute. These are tempered by the autonomic vagal nerve bringing the resting heart rate down to 60-80 "beats" per minute. Normal range is 60-100 "beats" per minute. A rate below 60 is termed sinus bradycardia, and a rate above 100 is termed sinus tachycardia. "Slow response" action potentials are carried into the cell primarily by relatively slow Ca++ currents, whereas most non-pacemaker action potentials are produced by cells that elicit action potentials that carry the depolarizing current via fast Na+ currents (ie. fast depolarization), in such as nerve and muscle cells. "The heartbeat" - Action potentials generated by the SA node spread through and depolarize the atrial tissue causing atrial contraction, then the impulse travels via the Atrioventricular (AV) node to the ventricles to elicit ventricular contraction. - Abnormal generation of action potentials at sites other than the SA node. Other pacemaker sites within the atria and ventricles (called ectopic foci) can cause additional beats or take over from the SA node, which normally suppresses these other pacemaker cells with its higher rate. 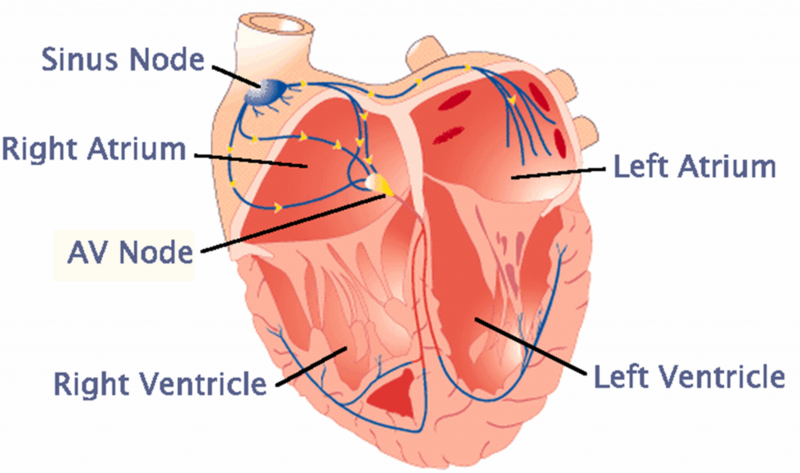 - Abnormal conduction pathways between atria and ventricles. Eg. accessory pathways.